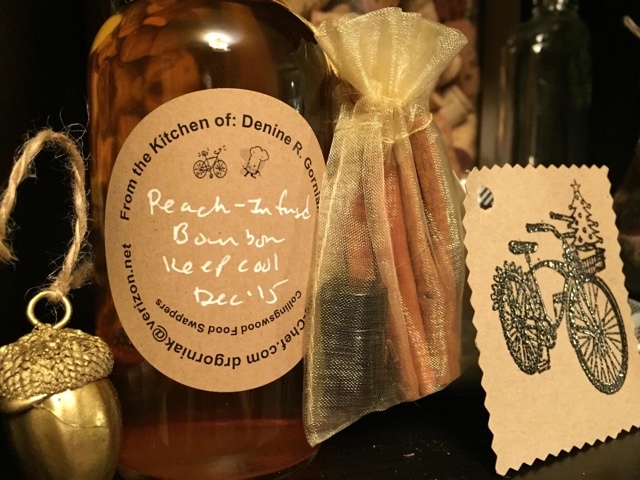 For holiday gifts this year, I gave out a peach infused bourbon, with an old fashioned spice mix to make a complete cocktail. Add it to a rocks glass with some ice and you're good to go with about 3 stiff drinks! 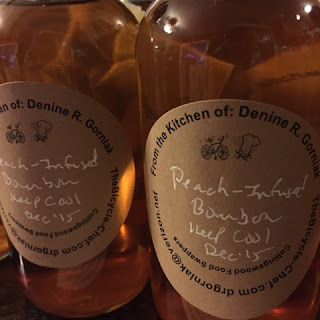 I put peaches into a glass gallon jar with some inexpensive Kentucky bourbon, back at the end of August. Good, fresh, juicy New Jersey peaches from a local farm. I should have probably decanted the bourbon months ago, but I forgot about the jug; it was under my kitchen sink, hiding behind boxes of trash bags and a growing collection of empty bottles of decent bourbons and ryes. I was only reminded of the infusion because we had to clear out the cabinet for the dishwasher repair man! Better late than never. 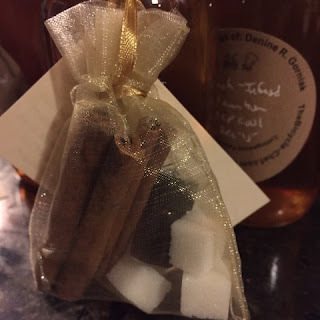 As luck would have it, I had a dozen clear Boston round bottles and caps; clear sealing toppers; spices and sugar cubes; and a few remaining silk sachet bags to hold the needed ingredients to create the perfect winter Old Fashioned. The recipe, slightly altered to accomodate what I already had on hand, is from a fantastic book called SHAKE, written by Eric Prum and Josh Williams. I'd say the idea to infuse the bourbon with peaches came from this book too, but I had thought about doing it long before I read the recipes. Cocktail gurus Prum and Williams just helped me onto the path for creating the "kits" and gift ideas. To make the bourbon, all you need is a large glass jar or bottle, some fresh peaches (in season) and a bottle of inexpensive bourbon. You could use a better quality but there's no real need to spend the money on something that you're going to use in a drink that has other ingredients. Generally speaking when you infuse with fruits, vegetables or spices, a basic spirit at a modest price is a better way to go. I took a bunch of peaches, pitted and cut them and added them to a large, clean glass jar. Poured in a big bottle, about 1.75 liters or 1/2 a gallon, of Heaven Hill Kentucky Bourbon. Close the jar and put it into a dark and cool place for a week or up to 3 months. When it's time to decant the bourbon, pour it through a fine mesh strainer lined with cheese cloth, into another clean glass jar. Reserve the bourbon soaked peaches for another use, such as adding into a coffee cake or bourbon peach upside down cake, or into a hearty salsa! The peaches can be "frozen"; they won't actually freeze due to the alcohol, but they'll keep longer for you. As for bottling the peach-infused bourbon, pour it into small pretty bottles, seal and label. Store the bourbon in a cool dark place and enjoy within 3 to 5 months. For my gifts, I consulted the SHAKE cocktail book for the Spiced Old Fashioned recipe. The original recipe calls for demerara sugar cubes - large, brown, rough cut cubes made from "sugar in the raw". The cubes have a molasses taste with notes of spice to them. They aren't super hard to find but you will have to look in specialty stores that carry great bitters and mixers or stores like Whole Foods. 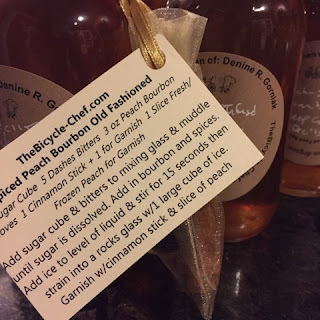 I used simple, white cane sugar cubes. It's what I have on hand and perfectly acceptable for an Old Fashioned cocktail. I did have to go to one unusual store to complete the kit. I wanted to include bitters iwht the spice mix. I figured most people don't have bitters on hand unless they are cocktail aficionados. So I looked high and low for ideas and then it hit me, small glass vials. It was too late to order them from online. I reached into my memory banks to recall a place from another lifetime - Wonderland, a "headshop" at 21st and Walnut Streets. Small, 1/2 ounce glass vials were procured. The perfect vessel in which to add a wee dram of bitters. The bags were form Joann's Fabrics. I printed recipe cards and then embossed them with embossing powder which gets heated with a special heating tool to affix the powder to the ink and "raise" the texture of the embellishment. Voila! A simple gift that is elegant and unique. Add sugar cube and 5 dashes of bitters to a cocktail shaker and muddle until the sugar is dissolved. Add in 3 ounces of Peach Infused Bourbon, cloves and cinnamon stick. Add ice cubes in to the level of the liquid and stir for 15 seconds. Strain the drink into a rocks glass filled with 1 large ice cube. Garnish with a cinnamon stick and if using, a slice of fresh or frozen peach. Enjoy!